Nate Wooley grew up in Clatskanie, Oregon, a Finnish-American fishing and timber town. He has spent most of his musical life whole-heartedly embracing the space between complete absorption in sound and relative absence of the same. 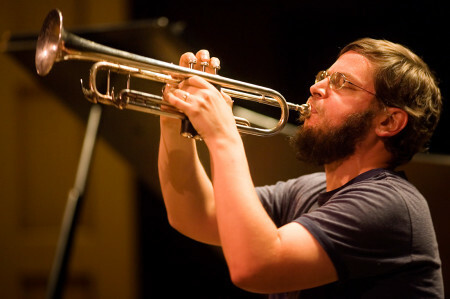 Nate’s trumpet playing is considered an organic mixture of the lower-case, new music, free jazz, and noise improvisation traditions. In the context of trumpet improvisation, he has worked diligently to keep one musical foot firmly planted outside of the recognized lineage. Fans of nmperign et al should find much to appreciate. Currently residing in Jersey City, NJ, he performs solo trumpet improvisations as well as with his trio Blue Collar with Steve Swell and Tatsuya Nakatani. He has also performed with Anthony Braxton, Bhob Rainey, Alessandro Bosetti, Fred Lonberg-Holm, Joe Morris, Fritz Welch, Herb Robertson, Kevin Norton, Tony Malaby, Randy Peterson, Tim Barnes, Okkyung Lee, Assif Tsahar, and other improvisation luminaries. Lyn Goeringer began to work with theremin, a “primitive” electronic music instrument developed in the 50s, as a gestural control device two years ago. Her interest in gestural controlled music came from the need to perform electronic music without resorting to tape and CD (which she still uses from time to time). She mainly uses the instrument as a controller for her laptop computer. A student of the electronic music great Marianne Amacher, her work covers a vast range of frequency and volume – you often feel it more than hear it. She recently relocated from Seattle to Boulder, Colorado. For this performance, Goeringer is presenting new work from a series called “Call:Response,” designed around the notion of imitation and repetition working to create multi-layered electronic music for live performer.